There were story lines up the zulio as we rode the shuttle bus from the parking lot to the course last Thursday morning. Months of anticipation now finally coming to fruition in that bone chilling, early morning fog. Tiger, Phil, and Bubba all paired together and teeing off early at 7:30. Fresh off his win at the Memorial we had to wonder was Tiger really back? Would he once again be the same Tiger we used to know? And was this finally the time that Phil would avenge himself for Wingfoot and the five second-place finishes over a career's worth of previous U.S. Opens? Both had been here in town several days prior for private practice rounds, so the nuances of the course and its current set up were hardly a surprise. Both had done their homework and were well studied. On Wednesday, Phil even took a break from the hectic at Olympic, and scooted over to the august San Francisco Club for a more casual warm-up. We knew going in that Olympic would not be to Bubba's liking -- far too tight, curvy, and tree-lined for a guy who likes plenty of airspace and room to roam. And what about Luke Donald -- world-ranked number-one with a superlative short game, yet still missing his first major? He would be paired that morning with defending champion and the game's newest darling, Rory McIlroy. Would it be Rory to rise again on the grand stage? And what of their playing partner, Lee Westwood, ranked number-two on the planet, and often proclaimed the best not to have won a major. Those were the mainline stories, followed by a slew of other feel-gooders. First, there was Casey Martin, out of the limelight and pro golf for well over a decade since his court battle with the PGA Tour to let him play with a cart due to a disabling leg disease. Tiger's former Stanford teammate is now coaching golf at the University of Oregon, and reportedly being paid substantially for a key role in development and implementation of the University's team uniforms for an assortment of sports, including U. of O. football. 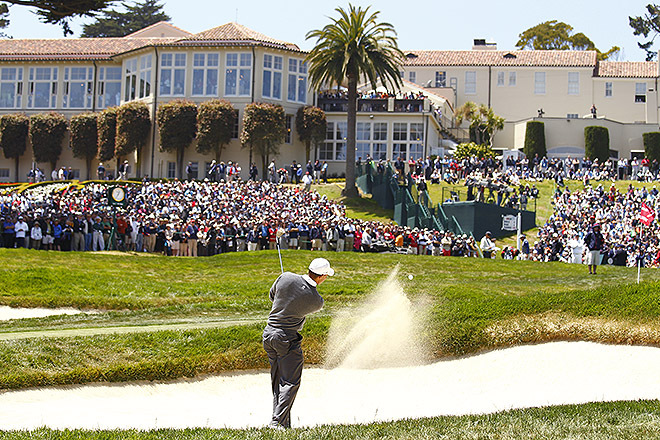 Martin played at least one pre-tournament practice round at Olympic Club with Tiger. Then there was the 14-year-old phenom, Andy Zhang, who was the youngest ever to qualify to play in the event. At the other end, was 53-year-old, Michael Allen, a former journeyman PGA tour player and decades-long member at Olympic, who resurrected his career as one of the major winners on the Champions Tour. His game was hot, and he certainly knew the course better than any of the other participants. And underlying it all was the haunting perspective that the game's biggest stars have never won in the historic four other National Championships held at the Olympic Club. In almost each case, a journeyman or lesser known player went onto defeat the brighter light (Hogan to Fleck, in '55, Palmer to Casper in '66, Watson to Simpson in '87, and in 1998, Payne Stewart, came in second to Lee Janzen). But let's face it -- it's Tiger and Phil who move the needle, and the throngs following them (even that early in the morning) dwarfed every other group on the course. Alas, Mickelson lost a ball on his first shot of the tournament, and was four over by the time he reached the 14th tee. Having just birdied the previous hole, he strode to the tee-box, where upon a fan yelled, "you got this Phil!" Mickelson grinned, and replied, "here ya go man," as he tossed a new Callaway Hex Black+ ball to the fan and then proceeded to yank another drive into the rough and bogey the hole. Tiger however, was totally in control that day and the next, consistently talking about "executing my game plan." As he held the lead going into the weekend, we had all but anointed him with the victory. Funny thing, his game didn't get the memo. The other heavies all fell by the wayside one day or another as well, and it was a newer name, Webb Simpson, who ultimately triumphed (watching the final group on TV from the clubhouse). The Olympic Club mystique prevailed once again, as the big stars each lost their luster. Still, it was a spectacle, an event that locally went beyond just the golf. 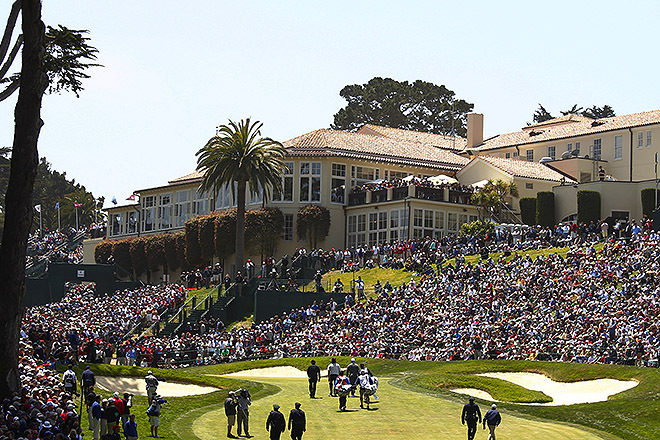 San Francisco showcased once again as America's fave, and the Olympic Club notched another triumph of its own. Some random notes: was good to see Raiders Super Bowl Champion Quarterback, Jim Plunkett, standing on the hillside with the crowd overlooking the action. Certainly, he could have been on the clubhouse terrace with a more chi chi'er grouping, but chose to be closer to the action. Was also nice to run in Jody Sanchez, Tournament Director of the Fry's.com Open, who noted that Ken Venturi would be announced this week as the official honoree of the upcoming Fry's event. Game plans aside, no word on whether Tiger will play there again this year.